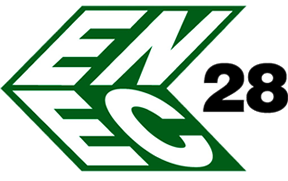 The ENEC is a registered European certification Mark for electrical products. It confirms that the products marked with it fulfil the requirements of the relevant European standards (EN), mainly related to safety. ENEC is a Europe-wide, high-quality, independent trademark guaranteeing product safety. Certification for the ENEC Mark is a program subject to surveillance after issuing the certificate. The ENEC Mark for electrical products granted by SEP-BBJ is recognized by European countries as well as some countries outside Europe, without any additional conditions. The ENEC certificate register is available at www.etics.org. The ENEC Mark with the number 28 is affixed to the products certified in SEP-BBJ.